Beautiful pink hues span the sky at sunset over the town of Fleur de Lys in Newfoundland Labrador where a couple of small boats use the ramp to launch for the night. The rocky coastal shores surrounding the town of Fleur de Lys in Newfoundland Labrador provide wooden boat ramps for fishermen to easily be able to launch their boats in and out of the water. A nicely painted boat has been launched at the top of the ramp as the pink sunset hues span the sky over Fleur de Lys and silhouette the surrounding hillsides. This seaside town is very quaint with its boat launch, fishing stages and waterfront homes which is home to approximately 300 permanent residents. 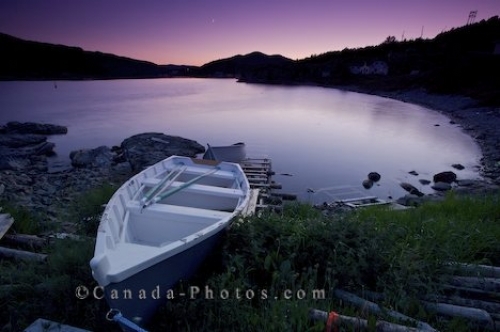 The scenery around the Baie Verte Peninsula in Newfoundland Labrador is breathtaking all the time but the sunset hours emit a calming atmosphere over the town of Fleur de Lys. When the natural wonders of the world blend together, it makes the life of a photographer somewhat simpler. Picture of the sunset hues shining off the boats on the boat launch along the shores of Fleur de Lys in Newfoundland Labrador.